Once in a while, I get in a baking mood, and I have to make something. Last week, while I was off, I decided on making some muffins for breakfast. I always keep on hand, a couple different varieties of Jiffy Mix. Not only do they make yummy mixes which are 58 cents a box (crazy! ), it’s a Michigan based company. I remember touring the production plant when I was in the fourth grade, donned with a paper “chef’s hat”, shoe protectors (like doctors wear in the OR) and a hair net! 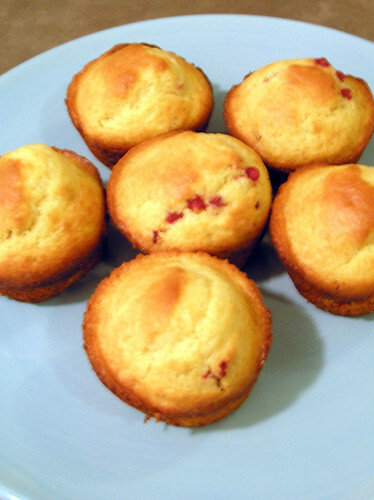 Muffins are fairly easy to make in general, but the mix is fool proof! Even if you lack skill in the baking department, these are easy to make. I couldn’t wait until they cooled down to eat them. Preheat oven to 350. Grease an 8 inch square pan. Combine first four ingredients. Mix with a fork until crumbly. Reserve and set aside 1/4 cup of crumb mixture. Press remaining crumb mixture on bottom of pan. Spread 1/2 cup of filling on top of crumb mixture to 1/2 inch from the edge of the pan. Bake 24-28 minutes or until lightly brown. Cool and cut. I used almost an entire pint sized jar of my mom’s homemade raspberry jam in mine (more than a 1/2 cup), and baked mine for 22 minutes. Yum! Hope you give the recipe a try. I love Jiffy mix, too – it’s so easy to work with, cheap (just like you said) and very versatile! I’m glad to know this. I have used the corn muffin mix but never the others. I wondered if they are good. I’ll try them now!